Our natural soy wine bottle candles are mindfully crafted using only the finest ingredients. 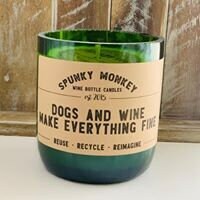 Each candle is hand poured into a recycled wine bottle that has been cut and sanded to perfection. Our candles have approximately 10 ounces of wax with a burn time of over 60 hours. They burn cleaner and longer without soot buildup. All of our candles are adorned with custom designed labels. We can design a candle for any occasion. We have a variety of scents available at any time with the capability of creating a custom scent just for you. Our scents will change with the seasons so check back regularly. We can create a candle for any occasion. Let us help you give the perfect gift for your loved one. You tell us what you want on your label or tell us the occasion and let us create something perfect just for you! Write your message in the “notes” section of your order or email spunkymonkeydw [!at] gmail.com. We welcome the opportunity to fill wholesale orders. Contact us at spunkymonkeydw [!at] gmail.com and let’s chat.